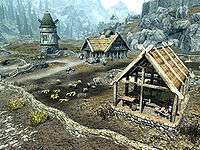 Battle-Born Farm is a farm just outside Whiterun, owned by the Battle-Born clan who are influential in the city. Alfhild and Gwendolyn tend the farm. The farm consists of several fields containing ten leeks, five gourds and six bushels of wheat. Alfhild will buy any leeks, gourds or wheat you have. There is a cow in a pen and three chickens wandering freely. The farm has lots of equipment around the property including a grain mill, which is south of the house, a tanning rack and a wood chopping block that are either side of the cow pen, and a grindstone which is under a covered store with a table and chair next to it and a bottle of wine on the table. There are two chicken nests next to a walled field. There is a quicksilver ore vein, two corundum ore veins to the north and one to northeast, across the road from the property and an iron ore vein among some rocks to the south as well. Around the house are several food barrels and large vat, with a few flowering plants at the back of the house and along the roadside.. The house is a single-room property with a stack of food barrels and sacks in the southwestern corner. Against the west wall is a narrow wooden table with a bowl of red apples on top. To the right, also against the west wall, is a bookcase holding eleven common books and a bunch of tundra cotton. In the southeastern corner is a square wooden table and two chairs, with an alcove to the left, along the east wall. The alcove serves as a bedroom and contains a double bed in the southeastern corner with an end table to the left holding a small coin purse and a sweet roll in a bowl. In the center of the room, toward the back, is a fire pit with a cooking spit over it. In the northwestern corner of the room is a cupboard holding several pieces of crockery, two bottles of ale, a sliced goat cheese, a gourd, a leathers strip and a rack of dog meat. To the right of this is a food barrel with an iron dagger on top. Further along the north wall are a couple of wall shelves that hold a small coin purse, crockery and a couple of food sacks. Against the east wall is a long wooden table and chairs, with a salmon steak, a bowl of carrots, a loaf of bread, a bowl containing three chicken's eggs, and a goat cheese wedge. 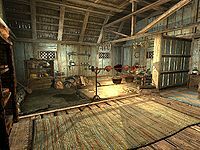 There is an apple pie by the hearth and a narrow wooden table against the partition wall between the bedroom and cooking areas. On this table is a bowl containing loaves of bread and crockery. There are also four salmon and two bunches of dried elves ear hanging from a beam that supports the roof. Esta página foi modificada pela última vez à(s) 03h32min de 28 de outubro de 2014.